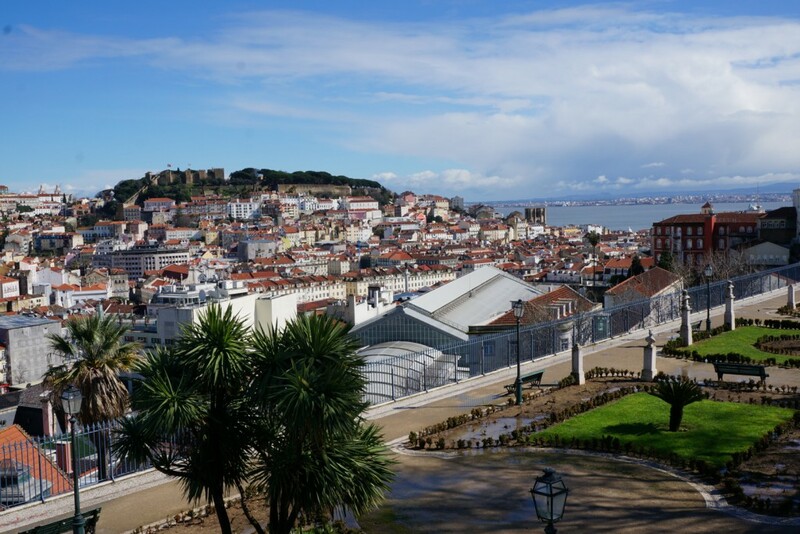 To break away from weekly routine, we went to Lisbon for a weekend. Ryanair flew us there from Brussels in a little less than three hours, a short delay included. Since Portugal is in a timezone to the west of Belgium, the travel time was reduced with an hour. Borrowed time which we would pay it back on the way home. Before setting in the final descend, the plane took a wide turn over Lisbon and the river Tagus, giving us a beautiful view on the city and its landmarks. The view gave us hope of nice weather, but rain greeted us when leaving the plane. The rest of the day downpours would interchange with sunny moments. We arrived in the Lux Lisboa Park hotel shortly before noon, a few hours before checkin time. We couldn’t get our room key yet but handled the administration and left our luggage in safekeeping. We were ready to explore the city. We asked the receptionist if she could recommend a nearby restaurant for lunch. After she suggested an Italian one and a quality burger restaurant, we clarified that we preferred a Portugese restaurant to try the local cuisine. And that’s how we ended up in O Cubo, a little family owned restaurant two streets from the hotel. We had Pastéis de nata, olives and bread with a Portugese sheep cheese for starters followed with fish and squid as the main courses. We concluded with some local liquors of the house, such as ginjinha and porto! Good food, friendly staff and not expensive. The hotel is not far from the Praça Marques de Pombal and from it we went south in the direction of Praça Luís de Camõese, where we would join a free walking tour through the city. Midway the Avenue da liberdade we took shelter from another downpour at a hotel. When we arrived at the square there was still some time left before the tour would start, so we sat down at the terrace of a bakery and had a pao de deus and a coffee. I really love this bread! The free walking tour is a tip based tour without commitment that takes around three hours and has a bit of an alternative vibe. From the square we and eight others were guided through the Baito Alto area, which is the nightlife borough filled with wine bars and pubs. Next we headed to Largo do Carmo, a pretty square with a lot of history. It was the focal point of the Carnation Revolution of 1974: the dictator Marcelo Caetano took refuge in the military police station until he surrendered. 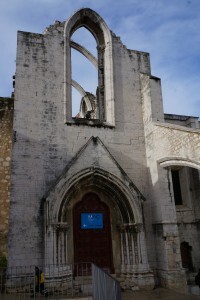 Next to the police station is the ruin of the Carmo Convent, which stands as a witness to the 1755 earthquake that destroyed two thirds of the city and killed a fifth of it’s inhabitants. At the back of the convent we had a beautiful view over the city. 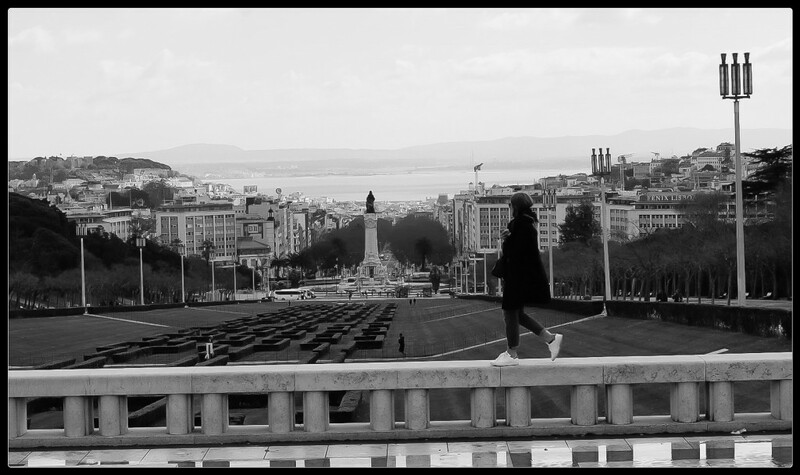 We took the stairs down and headed towards the Praça do Comércio, a big open square at the river side that was the entry to the city from the sea for the nobility. Next we were guided through the narrow streets of Lisbon’s oldest district: Alfama. It’s a maze and without a guide we could easily get lost in it. It’s not a rich place, but is beautiful in a nostalgic sense. We were offered a glass of ginjinha by a local lady and an old man started talking to us about the different plants on his balcony. Gabriella was our guide, a young Brazilian woman who lived in Lisbon for the past four years. She did an excellent job and I can recommend this tour. The tour concluded a bit after six and although we had an extensive lunch, we were more than ready for dinner. We headed back to the Praça do Comércio and took the ferry across the Tagus to Cacilhas. All public transport in Lisbon can be accessed with a green cardboard, rechargeable pass. The card itself costs 80 cents and each trip 1,80. Recharging can we done at machines or in most newspaper kiosks. During the boat trip sunset passed into dusk, and we left the ferry in the night. 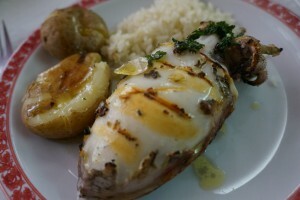 Just outside the ferry arrival there is a seafood restaurant named Farol. 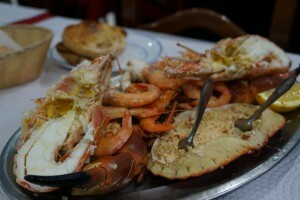 We had a big plate of scrimp, cooked scrimp, clams, crab and lobster, combined with oven roasted bread. A fresh feast. Tired from waking and travelling, we were ready to conclude the evening, so we hopped on the ferry back and walked to our hotel, were a very modern room with a huge comfy bed greeted us. The next day we rose early to get the most out of our second and last day in Lisbon. 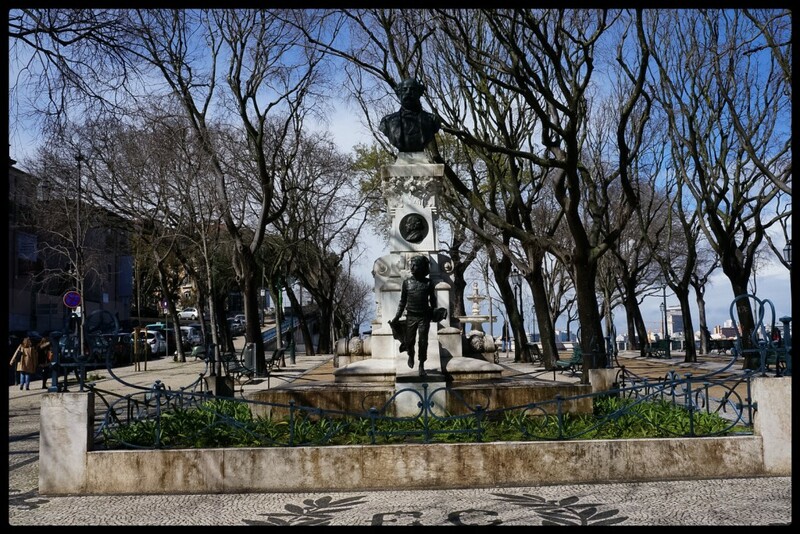 We checked out, left the luggage at the hotel in safekeeping and walked to the Praça da Figueira, where we would take tram 15 to Belém. On the way to the tram we had breakfast: Pastéis de nata, pao de deus with cheese and ham, coffee and fresh orange juice. 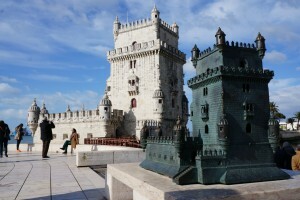 Belém houses two world heritage sites: Belém tower and the Jerónimos Monastery. From the tram stop we walked along the shore to the tower. We didn’t visit the tower, only admired it from the outside. In front of the monastery there was a long queue so we decided to skip it. 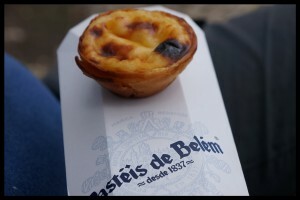 I’ve heard it’s not that great, but next to it, there is something that is: Pastéis de Belém, the most renowned pastry shop of Lisbon. And I must admit, they make them really tasty. We ate the pastéis in front of a Thai temple, a gift for 500 years of bilateral relationships. In a souvenir shop, the Indian (guess) shopkeeper recognized us speaking Dutch. He knew Leuven and had friends in Poperinge: the world gets smaller. We waited for a tram to take us back to the center of the city together with the same people with whom we’d taken shelter at a hotel from a downpour the previous day. We picked up our luggage at the hotel and took the bus too the airport where at around five a plane took off to take us home. I would love to return to this city, to see more of it and to eat more of its food.